Yeah what's goin' on Crazy mate??? That heat must be getting to ya!! !...lol Oh well Play On ! 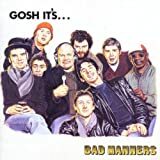 BAD MANNERS "gosh its......bad manners!"